With these words, handwritten on 214 penny postcards, Nina (pronounced Nine-a) Vance began, on October 7, 1947, the process that would soon result in the creation of the Alley Theatre. Intrigued and excited, Nina realized she had to let people know about the idea of a new theater, so she reached into her purse, found $2.14 and purchased the now legendary 214 postcards. The question of pay at the Alley was vague from the start. Initially, no one was paid. The first year, only two people received pay: the janitor and a fulltime office manager. When, at the end of that first year $750 remained, Nina took that as her year’s salary. But by the middle of 1952 a storm was brewing. The theater was still run by members - each of whom still paid 10¢ to have a vote in the theater’s future - and was staffed by volunteers, in the office and on stage. But, as the schedule of productions increased, it became harder to fill men’s roles and to find volunteers. At a tense vote, the board gave Nina full control to run the theater, both artistically and financially. This meant she could pursue her plan to have a full time director and to pay actors – not just local, but from anywhere, the only requirement being that they were good. The Alley’s first paid actor was Clarence Cavenaugh, appearing in Robert Ardrey’s Thunder Rock. The first name star, Albert Dekker, perhaps best known for his film roles in Dr. Cyclops and Among The Living, appeared in the 1954 production of Arthur Miller’s Death of a Salesman. According to Nina, “I was shaking like a leaf when I asked him.” The Play House, an Equity (union) house complained about an Equity member performing with non-Equity actors in a non-Equity production. In response, Nina contracted Jimmy Jeter, Maggi Denney, and other Equity actors, in 1954. This move signaled the transition from an amateur to a professional company. By the Alley’s 11th anniversary season, Nina celebrated the Alley’s remarkable production of Giraudoux's The Madwoman of Chaillot, declaring the Alley to be probably the only theater outside of New York to operate year-round – a tradition that enabled the Alley to maintain its professional company, and one that is upheld to this day. The vice president of the Ford Foundation in the 1950’s proclaimed the Alley as “the most significant professional theater outside of New York.” Nina was heard saying “I clawed this theater out of the ground.” When, in 1959, the Ford Foundation awarded the Alley a $156,000 grant to assist in the building of a resident ensemble of actors, it was proof of the success of her vision and her tenacity. In May 1962, Houston Endowment, the charitable trust established by the late Jesse H. Jones and Mrs. Jones, donated one-half block of land, the location for our current theatre. For all her gregarious ways, Nina Vance was a private person. Her health had been suffering, but she had kept the seriousness of her condition from everyone, even her staff and supporters. 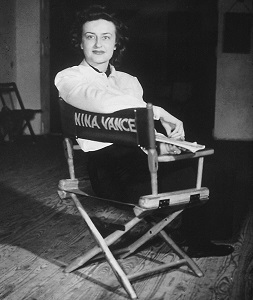 Then, on February 16, 1980, newspapers in Houston and around the nation announced the death of Nina Vance, finally separating the theatre and the woman who had birthed it and shepherded it through its formative years. In passing, she had finally relinquished control of the theatre, but had focused its mission, sparked its vitality and assured its future. London’s National Theatre sent actress Maggie Smith as an emissary for Opening Night, when the Alley opened November 26, 1968. The American premiere was restaged by Galina Volchek, artistic director of the Sovremennik Theatre in Moscow, a first-ever for this type of project.